I read this book a while ago (may have even mentioned it on this blog on one of my book lists) but I thought it deserved its own stand alone recommendation. To be honest, I love zombie things. I don't know why, I just do. I like zombie movies, video games, board games, books (obviously). The only problem is, they give me nightmares. (I know, I know, I'm like a nine year old that can't have sugar before bed time). So, my enjoyment of zombie flavoured entertainment is usually limited to broad daylight, well before nightfall, and usually with a few Disney movies thrown in afterwards for good measure. But even with my zombie handicap, I could not put this book down well before dark like I was supposed to. It was addicting, you just have to keep reading to find out what happens to Allison Hewitt and her comrades. Okay, I better back up. Usually, I do the synopsis first. Here's all you need to know. 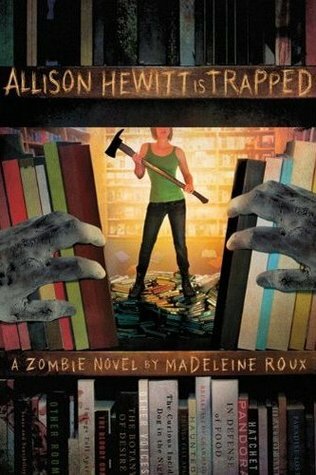 The book centers around a girl named Allison Hewitt who, up until the zombie apocalypse, works in a bookstore where (after said zombie apocalypse) she and her coworkers get trapped. The book is written through a series of blog posts she sends out into the void in the hopes of rescue, as she and her friends battle for survival in their new zombie infested world. It's brilliant, very tongue in cheek, clever and doesn't take itself too seriously. Just the way I like it. As I mentioned at the start, the writing is fantastic. You're pulled in from page one and childish nightmares be damned, you'll keep reading until the end. The blog post idea gives the zombie genre a fun twist and the cast of characters is lovable, hate-able and very relatable. Even if you're not a zombie lover, I encourage you to give this one a try. It's funny, ridiculous and the perfect antidote to reality.